To help people make an informed decision about My Health Record and whether to opt-out, we have held series of 6 webinars during the opt-out period. 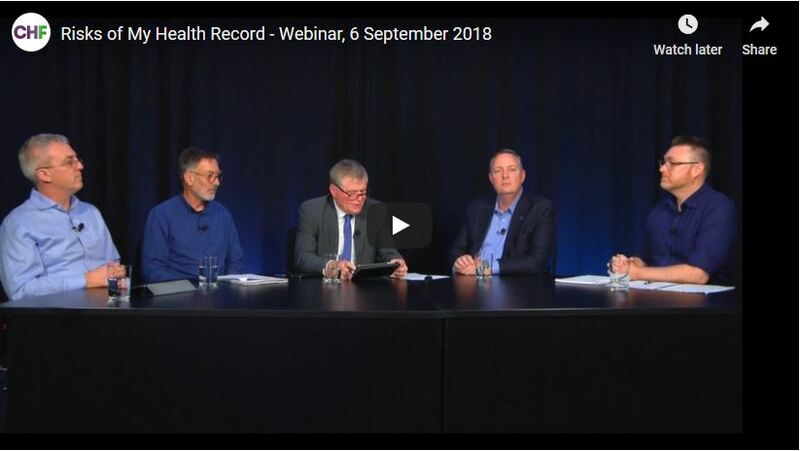 The webinars aim is to provide balanced, independent, factual and authoritative information about My Health Record and the opt-out process, and gave people a chance to have some of their questions answered. These webinars were made possible through funding provided by the ADHA. CHF and the ADHA have signed an MoU that protects CHF’s right to speak independently. In this webinar, we briefly covered My Health Record in general, then open a panel discussion that will focus on the privacy and security of the system, how legislation and policy affects it, and whether and what changes should be made to improve the privacy and security of My Health Record. 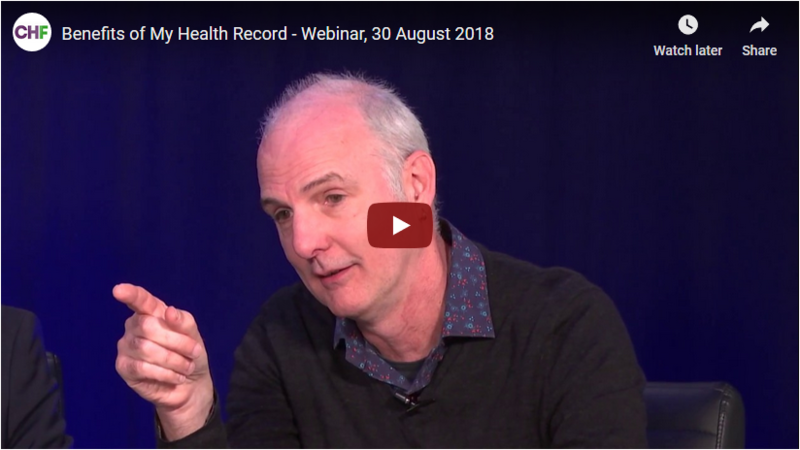 Click the image above to view our Privacy and Security of My Health Record webinar. "I, myself, have had five open heart surgeries and yet I still sometimes and the emergency department people say to me, "Do you suffer from anxiety attacks?" So I know that stigma is real and it's real at emergency times when people don't want it to be so I understand why people are sensitive, but having that in their record." "We need to look a bit beyond what we're hearing, and be I think hard headed, and think about what are the implications, discrimination perhaps, stigma, care, and ultimately respect for individuals. If the government was so concerned about privacy, why does it have to wait till five minutes to 12? " To properly understand My Health Record, it is important to know where it fits in the larger digital health landscape in Australia. 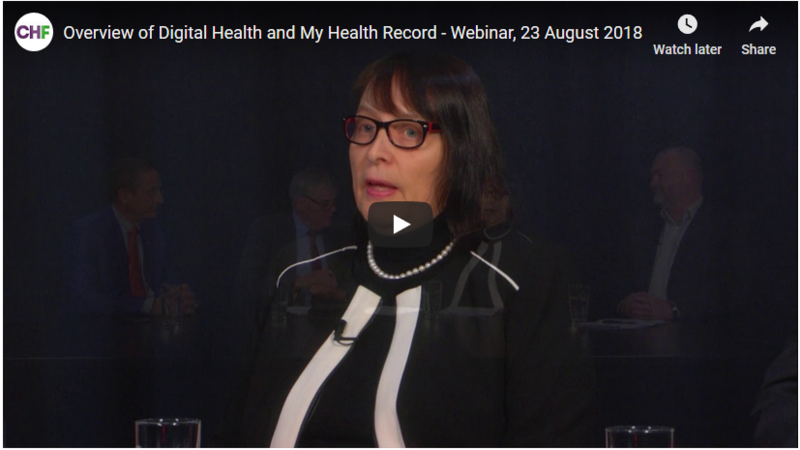 In this webinar, we discuss among other topics how My Health Record currently and could in the future interact with the rest of the Ausrtralian health system, the safety and quality impacts of digital health, and what else is happening in digital health. Click the image above to view our Overview of Digital Health in Australia webinar. A My Health Record system with the majority of Australians enrolled has many potential benefits for the health system in Australia. In this webinar, we discuss among other topics the benefits to the individual, the benefits to the health system, the barriers to realising benefits and what work is underway to measure benefits. This will include a discussion of some of the risks and limits, however the risks will be looked at in greater detail in following webinars. Click the image above to view our webinar on the Benefits of My Health Record. "My Health Record will assist in delivering person-centred health care, which is what it should be about. So clinicians will want to use it if they want the best outcomes for their patients and if they want their patients to be partners in their own health care." "Four times in the last couple of months I've had useful information that I've accessed through somebody's My Health Record that the patient hadn't told me, or had forgotten to tell me, and I didn't have access to it within my system. It's just raised up for me the whole point about how this should be patient-centered information, not hospital-centered and clinician-centered information. And until we get to that point, we're always gonna be making mistakes and having trouble." Click the image above to view our Risks of My Health Record webinar. "The risk that I think My Health Record poses is the possibility that people won't be able to be open and frank with their doctors because there is, in the back of their mind, a fear of that information won't stay between them and their doctor, and that there could be issues around criminalization or indeed any use that is not for a specifically health related issue will curtail people's ability to speak open and frankly to their doctors." "People say it's just a big database and the doctor can jump on or the health care provider can jump on and just browse the database. It's actually not correct. To be able to actually access the database, they need to conduct a conformance search, they need to have a software, they need to registered with us. And we audit all of that. We also, as part of our commitment ... and this an evolving capability that we've got going on as part of our enduring service, is to provide user behavior analytics so that we can actually look at what normal is and how health records are interacted with as part of a normal consumption pattern." In this webinar, we will discuss among other topics what skills are required to use My Health Record, the level of digital inclusion in Australia and discuss the ethics of the decision to opting people with low digital or health literacy into the My Health Record system. 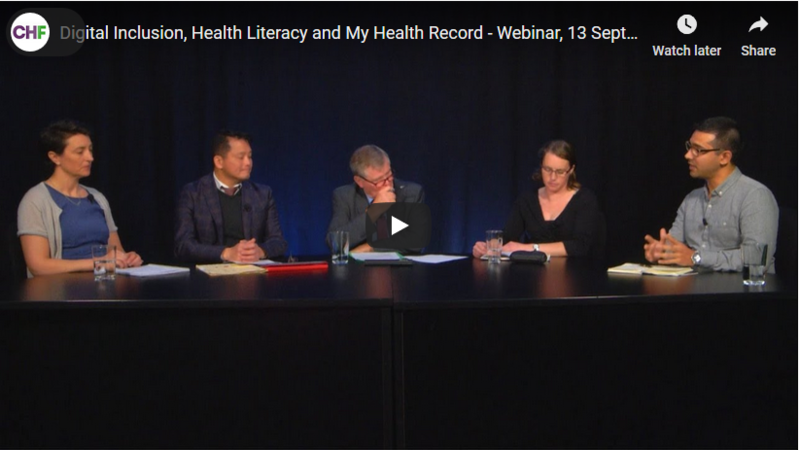 Click the image above to view our webinar on Digital Inclusion, Health Literacy and My Health Record. 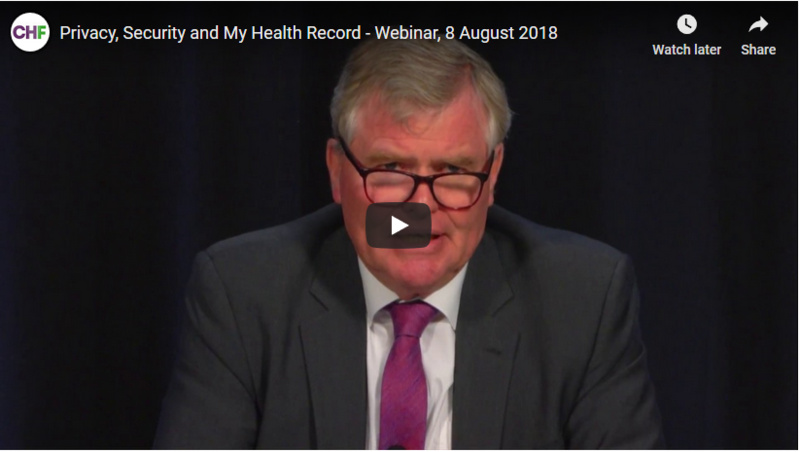 The final webinar of the series was an opportunity to summarise what has been covered, and put any remaining questions people had about My Health Record directly to representatives of the Federal Government. 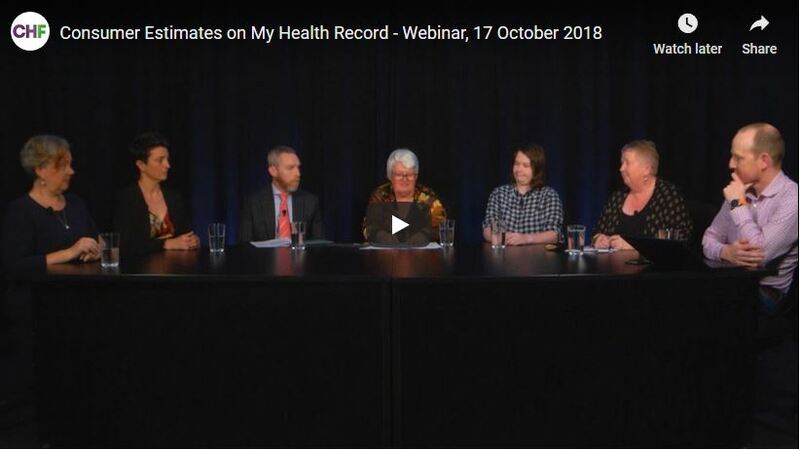 In this webinar, a panel of health consumer advocates asked questions of a panel of representatives from the Federal Government, in a style similar to Senate Estimates. The consumer panellists also shared their thoughts and experiences with My Health Record. Marc Niemes - Consumer, Digital and eLearning business founder, "Health is not something done to you, it is something you take part in"
Click the image above to view our Consumer Estimates webinar. "What is the point of that data? What is it being used for? People just want a bit more transparency around it. I don't think that's unreasonable. We can't just say, "People have suddenly learnt something and they're angry about it," when actually we've seen time and time again things like this happen across the world." "I hope I'm not flogging an issue, but I think we need to remember that there's a lot of people in the rural setting in the age bracket who can't even get money from the bank anymore, because they can't use an ATM and the bank's no longer in town. I think people with polypharmacy and comorbidities have got a huge gap in their IT abilities. We're going to have people who desperately need a centralized record not able to do any of this, and that worries me considerably." Recent Submissions, Blogs and Media Releases on My Health Record are collected below. For a complete list of CHF's media and publications on digital health, click here: chf.org.au/digital-health-media-and-publication.